Today, I thought I'd share how I organize my jewelry. I want to start by saying that this is by no means groundbreaking, but it's how I do it and it works well for me. 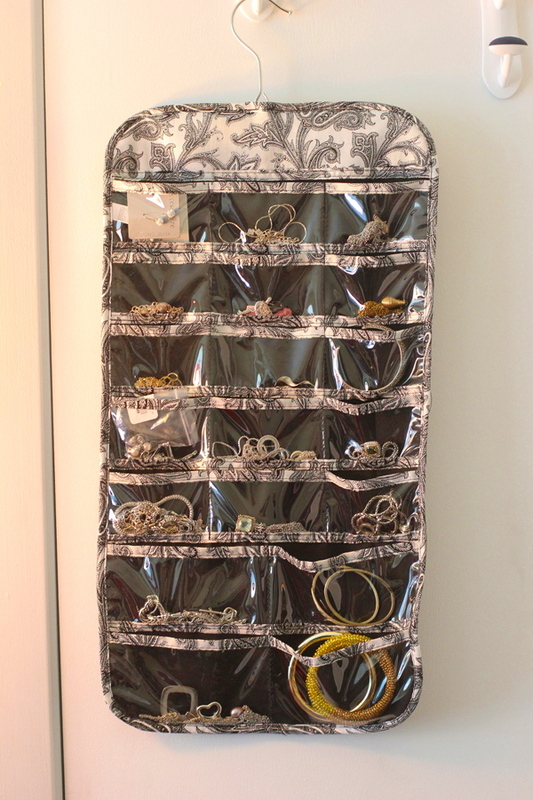 Sometime in college, my parents bought me a standing jewelry organizer like this one . 1) A large, standing jewelry tree that can sit on any flat surface. I bought this particular one because it had the most hooks to hang necklaces and bracelets, as well as a ring tray at the bottom which I use for rings and earrings. It cost about $8 from Ross, and I'm sure if you have a Ross, TJ Maxx, Marshalls, or any other discount store near you, you can find a similar one for a similar price. 2) A hanging fabric jewelry holder. This could be hung in your closet, over the door like I have it here, or anywhere else where you have a hook. There are pockets on both sides, but I put everything on one side so nothing is hidden as I have it hanging against the wall. This also cost about $8 from Ross. I put the items I don't wear as often here because, to me, it's harder to look in small pockets for something than to see it hanging on the jewelry tree. There are a ton of different options for jewelry solutions, and I'm sure you will find one that suits your needs. 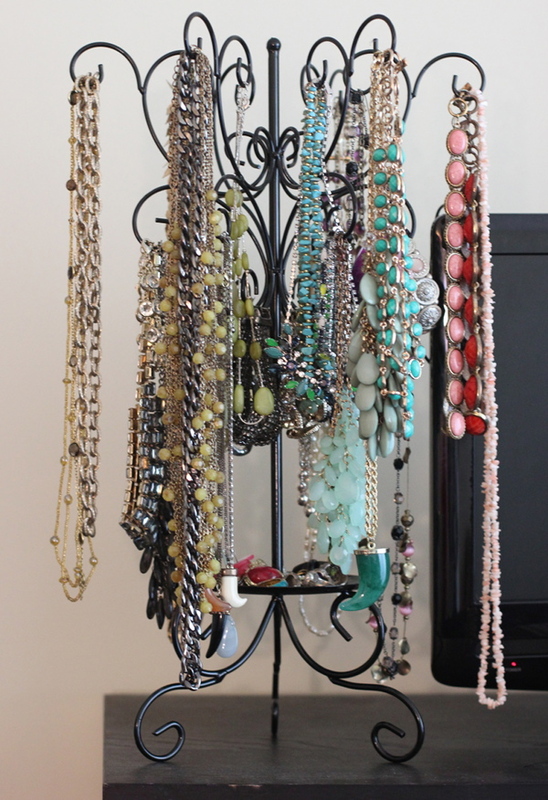 If you wear a lot of earrings, they sell trees that have small holes in them specially made for earrings , if you wear a lot of rings, you can buy a pretty bowl or tray to display them, and if you wear a lot of bracelets, you can get a jewelry stand with smaller spaces to accommodate bracelets. How do you organize your jewelry? Oh I liiiiike that tree. I have one of the wall hangers but I just tend to overlook whatever I put in it. Right now everything I own is scattered across dressers and the bathroom counter so I'm definitely in the market for some storage options. Thanks for posting! And the jewelry tray that's connected to/under my jewelry bar holds all of my earrings/rings. Wow, this was so complicated to write. MEH. It is about time I refresh my jewelry organization. My mom made me a piece in high school but it isn't nearly enough now - I may just ask her to make a bigger version as it does such a good job but is totally overloaded! my parents are crazies and drove down to florida for graduation so i sold them on driving down my jewelry box, haha. i was in the same situation... I now have a million jewelry trees with no jewelry on them. 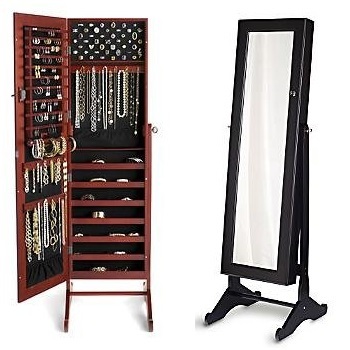 that jewelry organizer and mirror stand is awesome, i have never seen something like that before! what a shame that you no longer have it. i think you've done a good job of storing your jewelry though, i love the necklace 'tree' and the extra storage for smaller items. here is my jewelry storage tour post from my blog, it's a couple years old but shows some of the storage units i use! you're so lucky you have a handy mom!